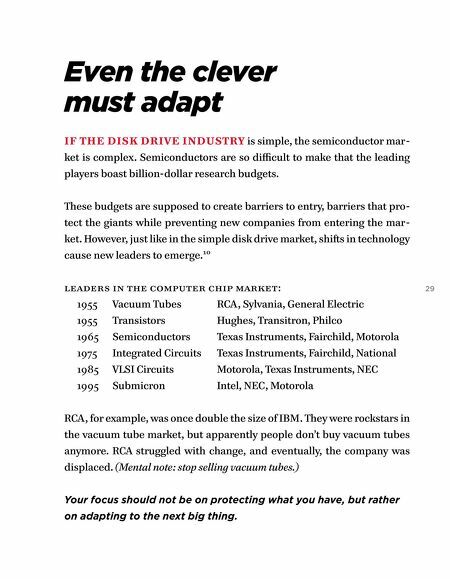 Even the clever must adapt IF THE DISK DRIVE INDUSTRY is simple, the semiconductor mar- ket is complex. Semiconductors are so difficult to make that the leading players boast billion-dollar research budgets. These budgets are supposed to create barriers to entry, barriers that pro- tect the giants while preventing new companies from entering the mar- ket. 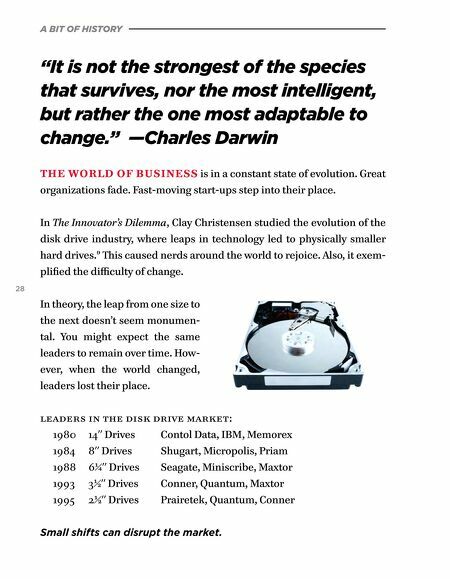 However, just like in the simple disk drive market, shiſts in technology cause new leaders to emerge.10 leaders in the computer chip market: 1955 Vacuum Tubes 1955 Transistors 1965 Semiconductors 29 RCA, Sylvania, General Electric Hughes, Transitron, Philco Texas Instruments, Fairchild, Motorola 1975 Integrated Circuits Texas Instruments, Fairchild, National 1985 VLSI Circuits 1995 Submicron Motorola, Texas Instruments, NEC Intel, NEC, Motorola RCA, for example, was once double the size of IBM. They were rockstars in the vacuum tube market, but apparently people don't buy vacuum tubes anymore. RCA struggled with change, and eventually, the company was displaced. (Mental note: stop selling vacuum tubes.) Your focus should not be on protecting what you have, but rather on adapting to the next big thing.